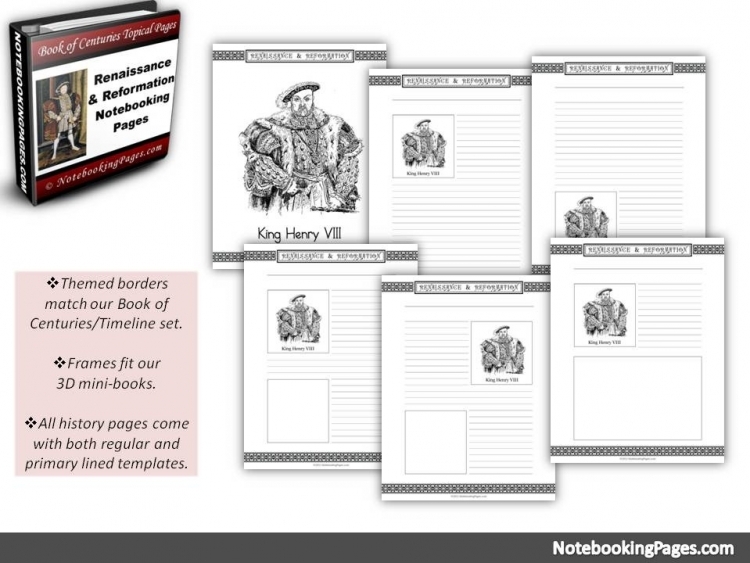 History Project Ideas- resources for ideas for the Renaissance and Reformation . History Project Ideas for the Renaissance and Reformation! Studying the Renaissance and the Reformation in our homeschool has easily lent itself to incorporating numerous history project ideas. Many of the ideas centre around the study of the artists and musicians from the time period. When studying the Renaissance, you will want to study the artists - and a part of that is to use their artwork as a basis to begin your own artwork. I have used Artistic Pursuits which helps you to model art work using the same technique of the artists. Other curriculum that also helps you to use these art techniques as a base for history project ideas is Meet the Masters. The pieces of artwork resulting from using this curriculum are amazing! Copying the Artists - is really the very best way to understand the Renaissance artists. Why not go to the library, collect books from the Renaissance Artists (or find some at your second hand bookshop - that's what I was able to do!!) - and then use that as your source for inspiration. Then use art materials that suit their style (pastels, oils, water colour) or even re-create the art work with paper, cellophane and other materials. When studying Degas, we used pastels, and tried to imitate the colours and movement of Degas and his dancers. Creating models is another wonderful idea to replicate some of the sculptures of that time period. You can make models from - clay, foil, paper mache, boxes, wire, plaster of paris and so much more. 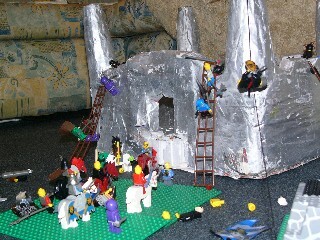 We made models of dancers from wire and aluminium foil and as you can see above, a castle from paper mache. 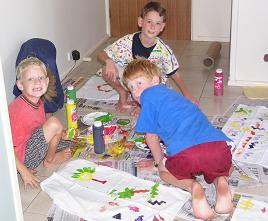 We also used plaster and painted on it while it was still in the drying process to make our own frescoes. First, you need to mix a batch of plaster. You can use Plaster of Paris to do this. Quickly pour into an aluminum pan or into a container which you can remove the plaster once set. Smooth the surface. When the plaster is almost dry, but still damp, paint onto the plaster with water colors, poster paints, or tempera paints. As the plaster dries, the pigments from the paint set into it. When studying the Renaissance and viewing the incredible inventions at this time, it makes so much sense to try to make your own. 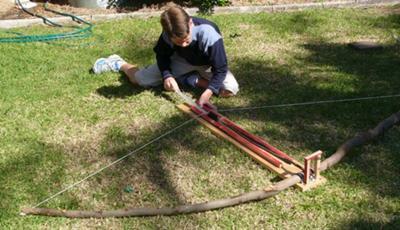 Here is Joel using his own homemade cross-bow modelled on what Leonardo had created. Using videos is a great way to understand certain mechanics and how inventions were built at the time. What I love about these models is that they are real hands on project ideas which help the student understand a working model and realize just how clever Leonardo da vinci was. Here are some great Leonardo design challenges from Museum of Science. Another project idea from the Museum of Science is to construct and use a replica of Leonardo's drawing machine to create a drawing with natural and correct perspective. Read more about Leonardo's Open Window Activity. I really like these Leonardo Art Projects for Kids - from happyhomeschoolnest. Here you will enjoy fun activities to learn about Leonardo - including making your own egg tempera. While studying the amazing printing press, we used simple idea of printing onto pillow cases. We used potatoes and cut out shapes, then dipped them into paint and printed them in different patterns onto our pillow cases. Of course, you can print anything and you can print using a range of items - shapes, blocks of wood, letters, shoes, hand prints, string..
At this time, you could also create a model of the planets - according to Copernicus and Ptolemy. Ptolemy, an Egyptian who lived nearly 1000 years before Copernicus, created a model of the universe with the Earth at the center. Later, Copernicus, studied Ptolemy's model and other theories and then created his model of the universe which placed the sun near the center. We investigated the early Renaissance artists, drew sketches of their original work and added narrations into our history books. 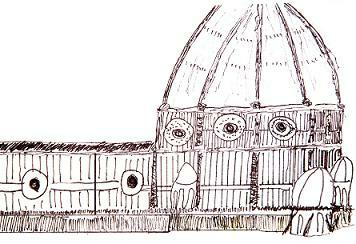 Here is Giotto and "The Flight to Egypt" and the story of Filippo Brunelleschi and the wonderful dome of Florence. What a wonderful experience it is to read and write about it - but then also to visit it, which is what my eldest son was able to do a few years ago - and we could do it in 2018! One of the authors of the 1600's is Shakespeare and if you not only want to read Shakespeare, but also 'experience' the time period and the play - you will just love what LitWits have done. You can read more about LitWits Kits on my site as I discuss teaching Literature. 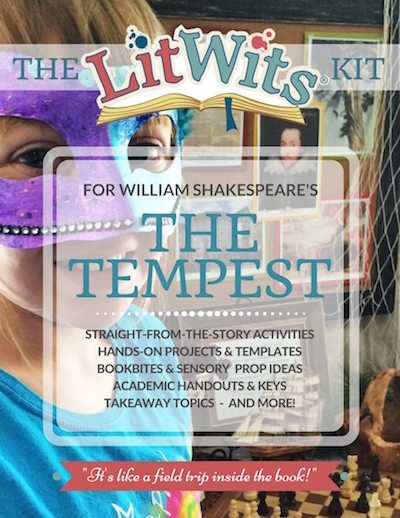 They have a Kit for "The Tempest" by William Shakespeare. 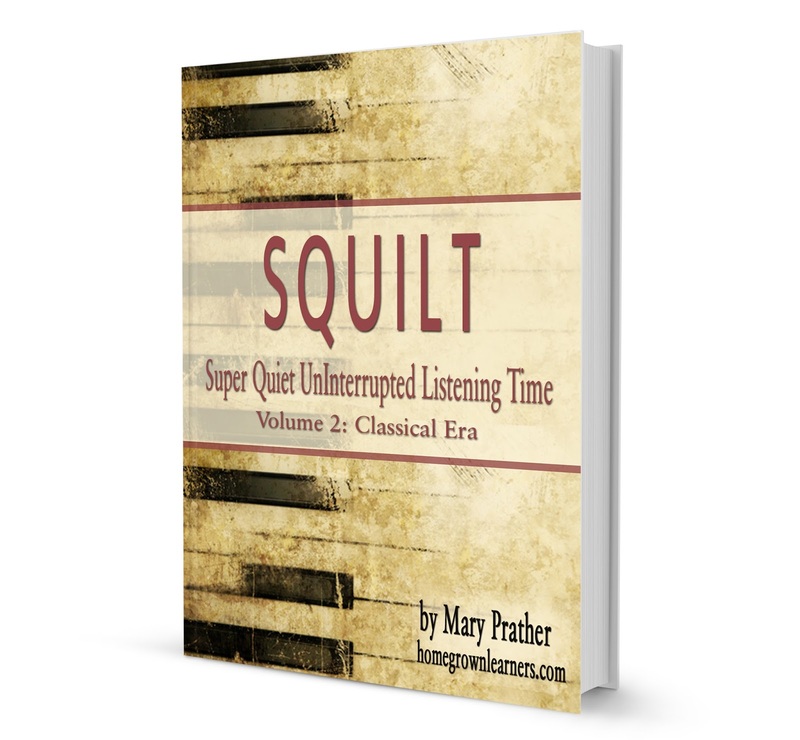 In order to develop the love of music as well as appreciation of the Classical composers, you would love the SQUILT: short for Super Quiet UnInterrupted Listening Time. It is perfect for preschoolers, elementary students, and young middle school students. Each DIGITAL volume contains 10 lessons, including printables, links, and everything you will need to guide your students through their SQUILT activities. To help us remember the musicians and their works, we have enjoyed using "Themes to Remember" -Once you've used this there is no way you will ever forget "Spring" by Vivaldi. Great music put to words to help you remember. It certainly has been helpful to our family. For those who enjoy making notebooks or lapbooks as a part of a history project idea - you will love the notebooking pages collection below. Using these is an easy way for your children to create a memory by recording what thy have learned on an appropriate notebook page. You can add this to a poster or incorporate it into a lapbook. 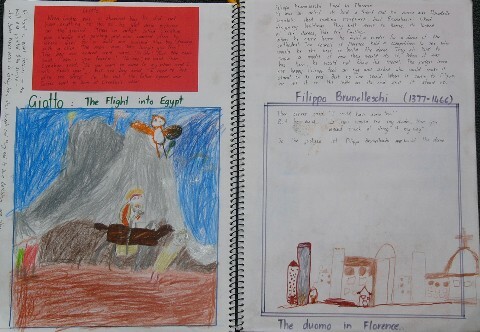 This selection includes explorers, famous composers, and Book of the Century timeline pages. It is an ideal way to combine the love of reading exciting living books with writing narrations about the characters and historical events. 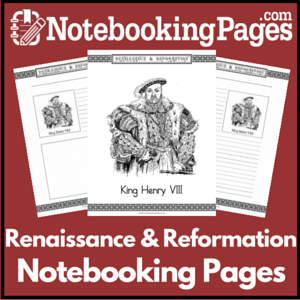 Click on the image for more information on Renaissance Notebooking Pages.